Whip this simple concoction up the night before for a hearty, satisfying breakfast bowl that’s ready to get going when you are. It’s no secret that we love breakfasts that can be prepped at night and are ready to go first thing in the morning (see: Chia Breakfast Bowl & Cold Brew Iced Coffee). So when I started seeing photos of overnight oats popping up all over my instagram feed, I knew we had to give it a try. I started where I often start when trying new food trends – with Minimalist Baker. Her Peanut Butter Overnight Oats were the perfect gateway into this incredible no cook breakfast trend. 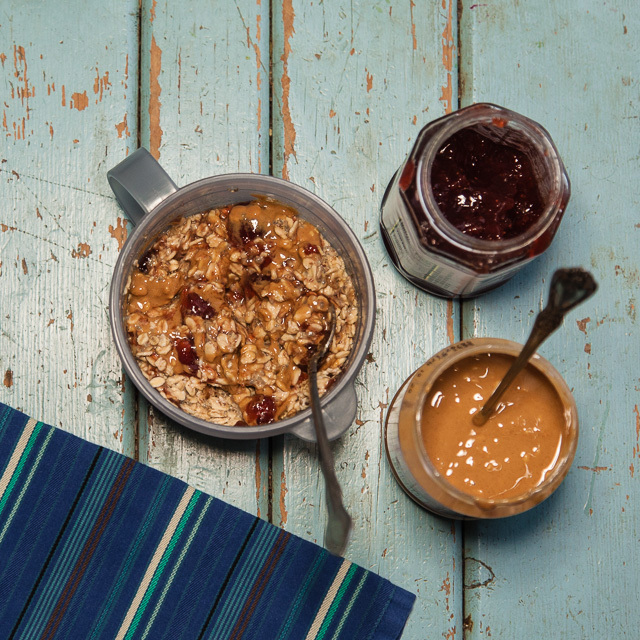 After getting comfortable with her recipe, I gave it a few tweaks of my own, and thus, these PB & J Overnight Oats were born. This recipe makes a single serving, but you could certainly double or quadruple it and spoon it out into separate bowls to share. In a tupperware or small bowl, combine almond milk, chia seeds, flax, agave, salt and 1 tbsp of peanut butter. Stir until peanut butter dissolves a bit, but some chunks are okay. Add in oats and stir until they are covered with the liquid. Cover the container with a lid or plastic wrap and place in the fridge overnight. In the morning, the oats and chia will have absorbed the liquid and be thick and smooth. Swirl in the remaining peanut butter and the jam. Enjoy! Cook time refers to overnight time in the fridge. If using salted peanut butter, simply omit the pinch of salt. If using sweetened almond milk, simply omit the agave syrup.